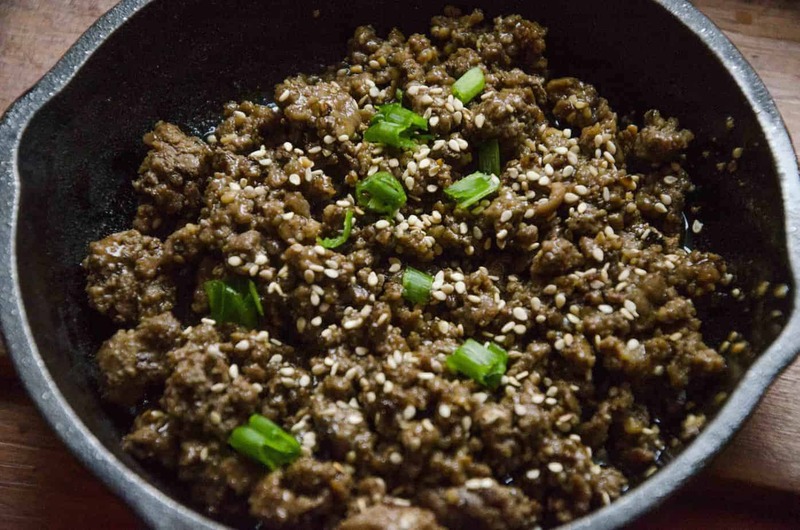 This easy sugar-free Korean beef Bulgogi dinner is delicious! You can easily use the more traditional cuts of beef, but to make it easy and cheap we used lean ground beef. It has all the classic flavors of garlic, brown sugar, soy sauce, sesame, and ginger but is sugar- and soy-free. This is a healthy, flavor-rich meal that the whole family will enjoy. Even better, it’s a simple weeknight dinner option that you can make up in no time at all! If you’ve never tried it, don’t keep waiting. I promise it’s yummy! 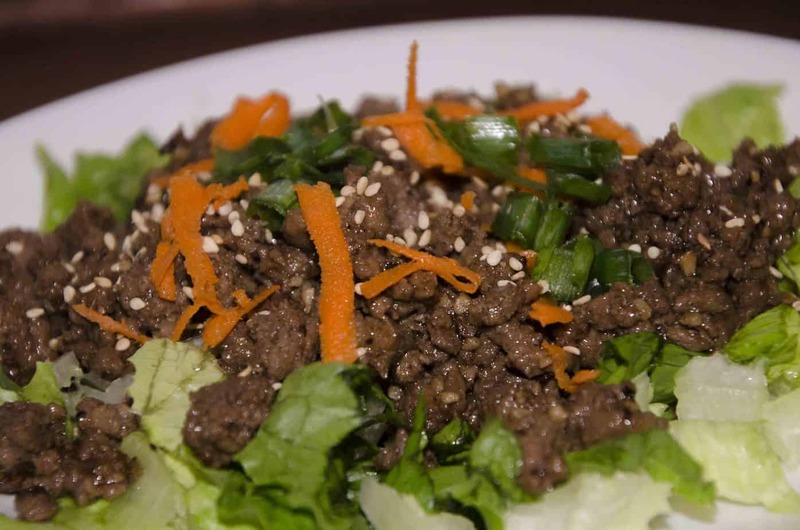 What is Bulgogi (or Korean beef)? Traditionally, bulgogi is made out of tender beef that has been marinated in a pureed pear paste. The enzymes in the pear tenderize the beef and the sugars in the fruit add a sweet flavor. And really, how cool is that? Brown sugar, soy, garlic, and ginger combine to create a slightly sticky, thicker sauce that clings to the meat. It’s usually served over rice and garnished with toasted sesame seeds and green onions. Is your mouth watering yet? I’ve seen it served with shaved or pickled carrots and some other veggies in its Americanized form and even been to an awesome fusion restaurant that used Bulgogi in tacos. They were delicious! Mmm, now I want some! The question then posed itself: how can a large family indulge in yummy Bulgogi when some of them don’t eat sugar? This trim healthy mama needed to get to work in the kitchen! And nobody had time to make pear paste and thinly sliced steak. That’s how this easy ground beef version came to be. We by-passed the steak and softening steps, and went straight for a package of 97% lean ground beef. Flavorful, but not fatty, and no need to tenderize. And if you want some other delicious, sugar-free recipes be sure to check out the other recipes I’ve converted to sugar-free so that I can enjoy them on my Trim Healthy Mama journey. Did I Mention This Was Easy? 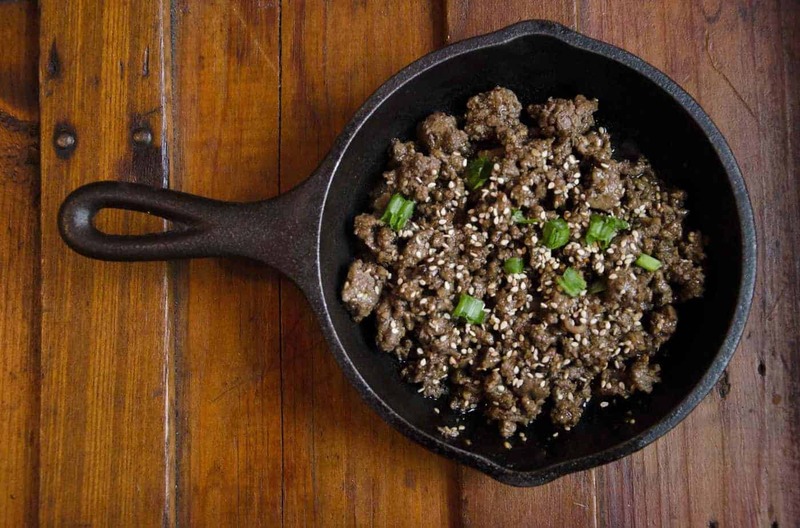 The first step to make this easy sugar free Korean beef is to heat a heavy bottomed pan (you know we used our cast iron skillet here!). Drizzle a tiny bit of sesame oil in the skillet (seriously, you don’t need a lot) and add in your lean ground beef and minced garlic. Cook until beef is brown and crumbly, but not burnt. While your meat is heating up, you’ll make up the sauce. Whisk together ginger, pepper, coconut aminos, apple cider vinegar, erythritol, stevia, sesame oil, and blackstrap molasses. In a separate bowl, whisk together water and glucomannan. Next, add the water and gluccie to the rest of the ingredients and whisk them well. Immediately pour over the already cooked meat, constantly stirring so that the sauce heats and thickens. Immediately pour over the already cooked meat, constantly stirring so that the sauce heats and thickens. This step will only take a minute or two. We like to add a tiny sprinkle of toasted sesame seeds and green onions on top, too. And most of our family also likes the added sweetness of some shaved carrots added in at the end. We serve it up over rice or in a romaine lettuce boat. 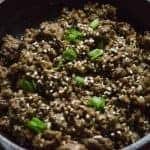 Simple and delicious, with all the flavors of classic Bulgogi, this dinner comes together quickly and is a crowd pleaser. Start cooking rice in rice cooker or on stove top. Add in garlic and beef, cook until brown and crumbly but not burnt. While beef is cooking, make sauce. In one bowl, stir together all sauce ingredients EXCEPT water and glucomannan. Whisk together well. In another bowl, whisk water and gluccie together well. Mix the water and gluccie into the the rest of the sauce, whisking well. Pour sauce mixture over cooked beef and garlic, mixing well over low heat. Stir continuously as sauce thickens. Remove from heat. Serve over rice or a salad or in a romaine boat. This meal is an easy THM S if you serve it in a romaine boat or on a salad. Leave off the shaved carrots or have a small garnish amount. This meal can be a THM XO if served over rice. I’m totally going to sub out vegan ground for the beef & make it vegan. It’s all about the sauce & this one sounds delicious! Thanks! oh my goodness! This i so good, I can easily over indulge in this, and eat the whole thing! LOL I didn’t but it is very yummy. Right?! I just LOVE bulgogi! And there are so many ways to enjoy it 🙂 Thanks for the 5-stars and the reply!